A 19-year-old man has died after a collision near Horley, Surrey Police has said. The collision happened at 11.30pm last night in Rookery Hill, Outwood, near Horley. A 20-year-old woman was also seriously injured and was taken to hospital. Police are now looking for the driver of a white van in connection with the collision. He was seen leaving the scene on foot as the emergency services arrived, police said. A spokesman said: “Surrey Police is looking for the driver of a white van in connection with a collision late last night in which a passenger sadly lost his life. “A white ‘55 plate’ Vauxhall Combo van was driving north when the driver lost control and collided with a tree. “The driver of the vehicle was seen leaving the scene on foot as the emergency services arrived. “Officers are concerned for their welfare as it is likely they received significant injuries and could require medical attention. “Despite a thorough search of the local area, officers have been unable to locate the driver. 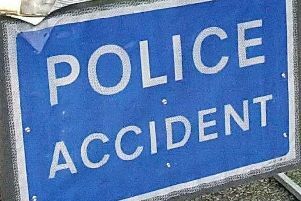 “The two passengers in the van were injured in the collision – a 19-year-old man was taken to hospital but sadly later died of his injuries. His family have been informed. Jamie Dann, from Surrey Police Serious Collision Investigation Unit, added: “It is important we speak to the driver of the vehicle as soon as possible, as they may require serious medical attention. “I’d urge anyone who suspects that someone they know could be the driver - perhaps they have come home with unexplained injuries, or have access to a vehicle fitting this description and have not been seen since last night – to contact us as a matter of urgency. Anyone with information, or dash-cam or helmet-cam footage, which could help the investigation, is asked to call Surrey Police urgently on 101 (999 in an emergency) quoting ref PR/45180114652.